NELLIS AIR FORCE BASE, Nev. (AFNS) -- The 66th Rescue Squadron paid their respects to their fallen brothers during a memorial August 29, which marked the 20th anniversary of their deaths. A total of 12 Airmen were lost when two HH-60G Pavehawk helicopters, call signs Jolly 38 and Jolly 39, assigned to the 66th RQS were involved in a midair collision over the Nevada Test and Training Range during a routine night exercise Sept. 3, 1998. Current members of the 66th RQS, 58th RQS and the 823rd Maintenance Squadron assembled at the Nevada Test and Training Range to clean and restore a memorial built in honor of Jolly 38 and Jolly 39. The memorial resembles two giant feet associated with the rescue mascot, the Jolly Green Giant. The clean-up efforts included removing weeds, collecting trash, painting and manicuring the site and surrounding area. “We spent several hours cleaning up the memorial site so that the Airmen flying over this area of the range can recognize the giant feet and the sacrifice made twenty years ago,” Shonkwiler said. Aside from cleaning the memorial, Airmen joined in prayer and had a moment of silence for the men who paid the ultimate sacrifice that night. During their remembrance, Shonkwiler reminded those gathered at the memorial that what they do is not only dangerous, but extremely vital to the Air Force mission, the nation and coalition forces. The 66th RQS conducted a ceremonial toast to all 12 Airmen and unveiled a 20th anniversary shadow box, containing pieces from the crash site belonging to the aircrew and aircraft. The shadow box will be permanently displayed in the squadron as another reminder of the legacy and sacrifice of Jolly 38 and Jolly 39. 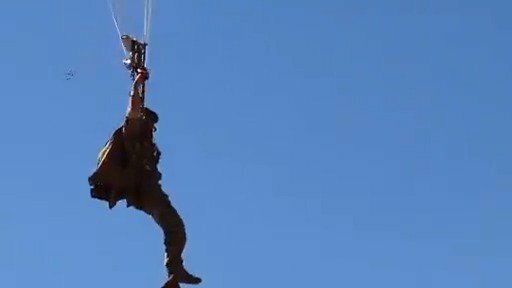 The combat search and rescue community motto, “These things we do, that others may live,” is a reminder of the sacrifice a rescue member is willing to make to ensure someone who’s having their worst day, doesn’t have their last day.